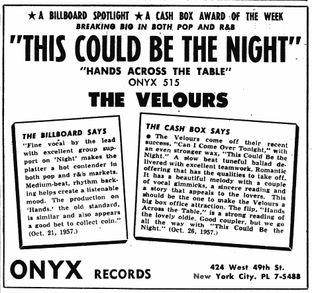 The Velours were an American R&B vocal group who had two minor pop hits in the US in the late 1950s, "Can I Come Over Tonight" and "Remember". They relocated to England in the late 1960s, changed their name to The Fantastics, and had a top ten hit in the UK in 1971 with "Something Old, Something New", followed by a minor US hit with "(Love Me) Love the Life I Lead". The group originally formed as The Troubadours in the Bedford-Stuyvesant area of Brooklyn in 1953. 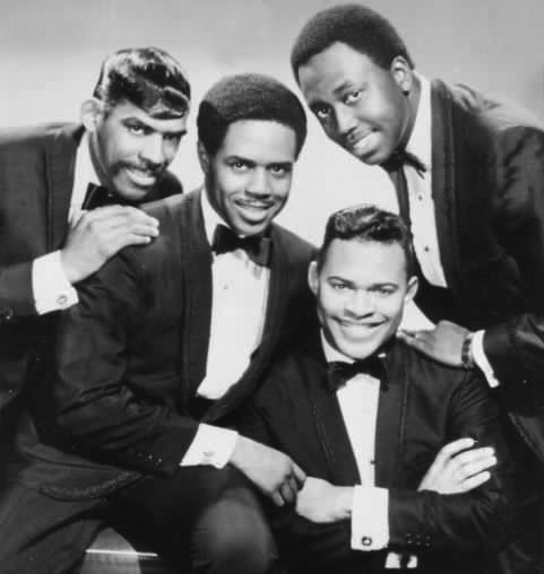 The original members were Jerome "Romeo" Ramos, John Cheatdom, Marvin Holland and Sammy Gardner. In 1955, Gardner left to join the army and was replaced by Cheatdom's cousin, Kenneth Walker. 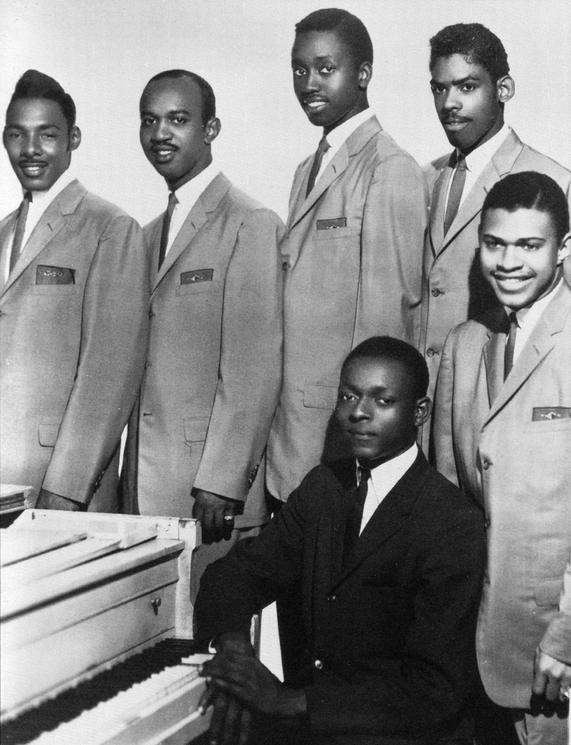 The doo-wop group performed locally, but with little success until in 1956 they added a fifth singer, tenor Donald Haywoode, and changed their name to The Velours. 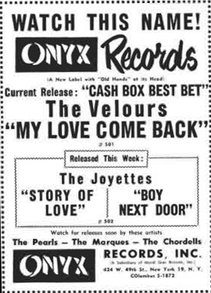 They made their first recordings for the Onyx label, before Holland and Walker left and were replaced by John Pearson and Charles Moffett. They also added a pianist, Calvin McClean. 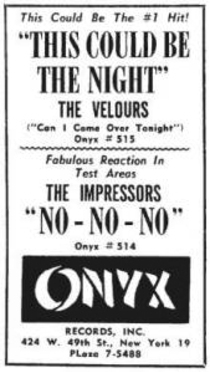 Over the next two years they made some of their best-remembered records for Onyx, including "Can I Come Over Tonight", written by Haywoode, which reached number 83 on the Billboard pop chart in 1957. They had further chart success the following year with "Remember", with Ramos as lead vocalist, which again reached number 83. They regularly performed at the Apollo Theater, and shared stages with such stars as Roy Brown, Fats Domino, Larry Williams and Bo Diddley. After adding a sixth singer, Troy Keyes, they recorded for several small New York labels through the late 1950s and early 1960s, including George Goldner's Gone, but with little success, and the original group disbanded in 1961. 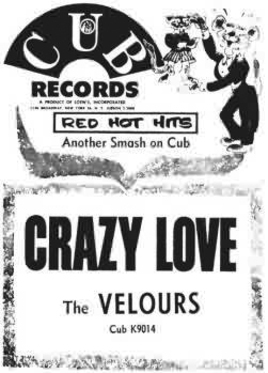 In 1966, Ramos, Cheatdom and Haywoode decided to reform the Velours, adding tenor Richard Pitts. In 1967, they released the single "I'm Gonna Change" on MGM Records, and agreed to undertake a tour in England. When they arrived in Britain, they discovered that they were to be billed as The Fabulous Temptations, and were expected to perform Motown songs. However, they toured successfully and were invited to return, in 1968, by Sheffield club owner Peter Stringfellow, this time under another new name, The Fantastics.They decided to remain in Britain, and recorded several singles released on MGM and then on the Deram label in England.